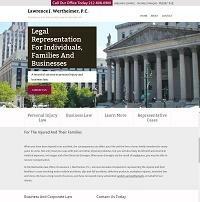 Founded in 1992, our law firm has a long record of successfully representing accident victims. Over the years, we have built a reputation for obtaining positive outcomes and securing substantial settlements and verdicts, and insurance companies are well aware of our aggressive nature when we fight on behalf of our clients. With so many years of experience successfully representing clients, our law firm has the resources necessary to fully investigate and prepare for our clients' cases no matter the complexity or scope, and we absorb all the costs associated with preparing a case until we achieve a successful result. Working on a contingency basis, we will not collect attorneys' fees unless we recover damages, and we are proud of the referrals we receive from satisfied clients. Anyone who needs assistance obtaining his or her rightful compensation after a preventable tragedy can contact Lawrence J. Wertheimer, P.C., for a free consultation. As an added measure of convenience for our clients, we can arrange to meet at a location outside our office if our clients cannot come to us.